I haven’t played Super Mario Odyssey, and I’m sure I’d be terrible at it if I did. There’s a reason I mostly stick to turn-based role-playing. 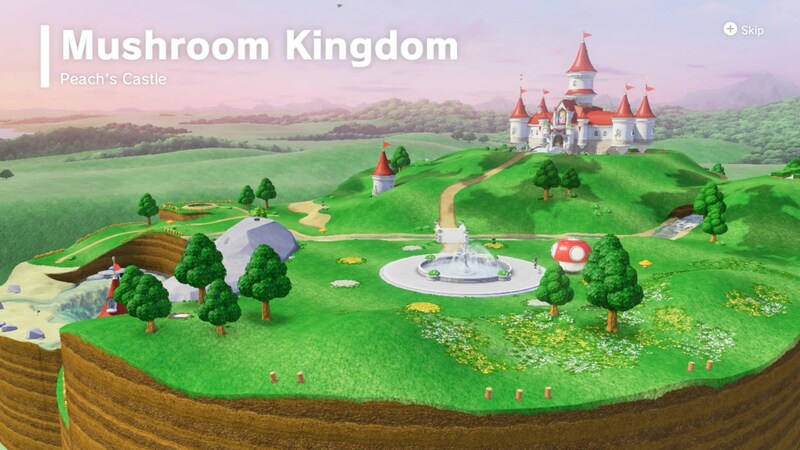 I am, however, quite interested in keeping abreast of new Mario developments and how they affect the games’ universe in general, particularly the geography. As such, I was excited to learn that early media released for Odyssey included a map, and a fairly detailed one at that. 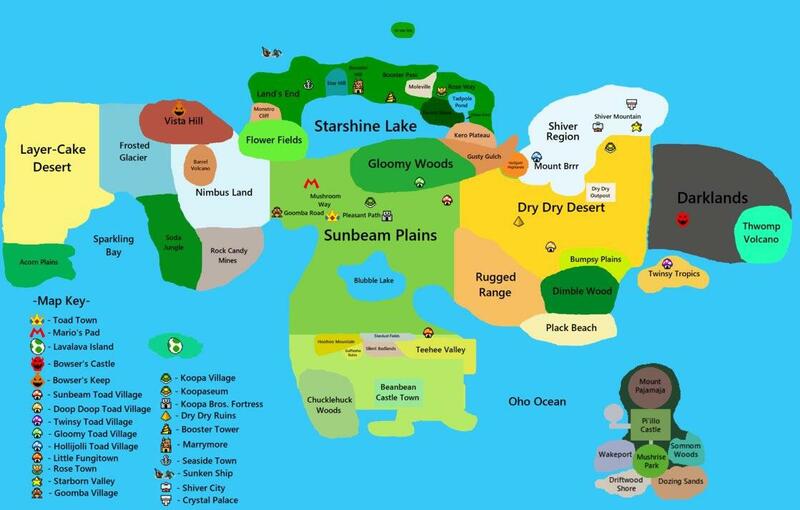 While I suppose it’s possible to fit locations previously said to be in or adjacent to the kingdom onto this landmass, wouldn’t that make the other kingdoms really enormous? I suspect it’s something like what was done in Zelda II and Dragon Quest II, where the entire playable area from the first game is merely a small section of the map from the second. It serves to emphasize how big the new game world is, but at the same time it means leaving out a lot of stuff. This is apparently the way of the Mushroom Kingdom in Odyssey, where apparently not even Toad Town appears. This post from Marioverse on Reddit has a map by LukerGamerz that fits a lot of the places from other games into a mushroom shape. 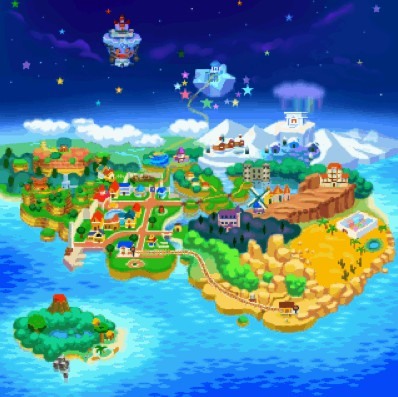 Another version of the map has gained attention due to its possible inclusion of Isle Delfino from Super Mario Sunshine, which doesn’t appear in the game itself. If you compare it to the other map, however, the dotted line at 45 degrees has apparently become the equator. 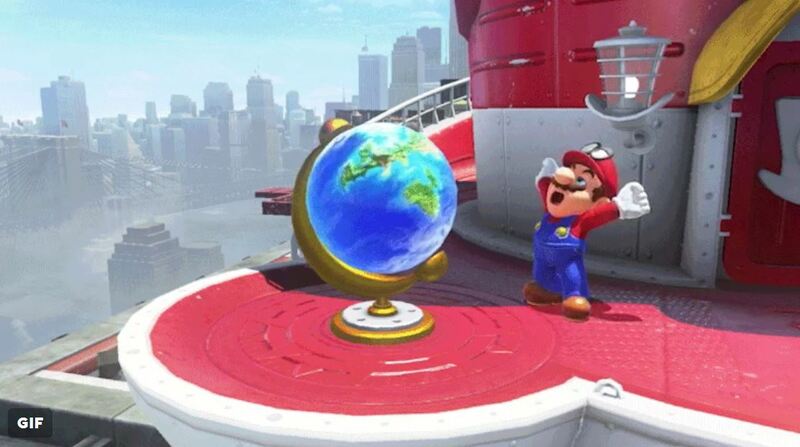 The latitudes suggest this is only the Northern Hemisphere, but I’m pretty sure it shows all the locations you can visit (well, not counting the Moon), and why wouldn’t Mario’s ship be able to reach the Southern? On the other hand, it also allows us to imagine places that aren’t shown as being just off the map. The Pudding Continent mentioned in Paper Mario: The Thousand-Year Door must be somewhere, right? 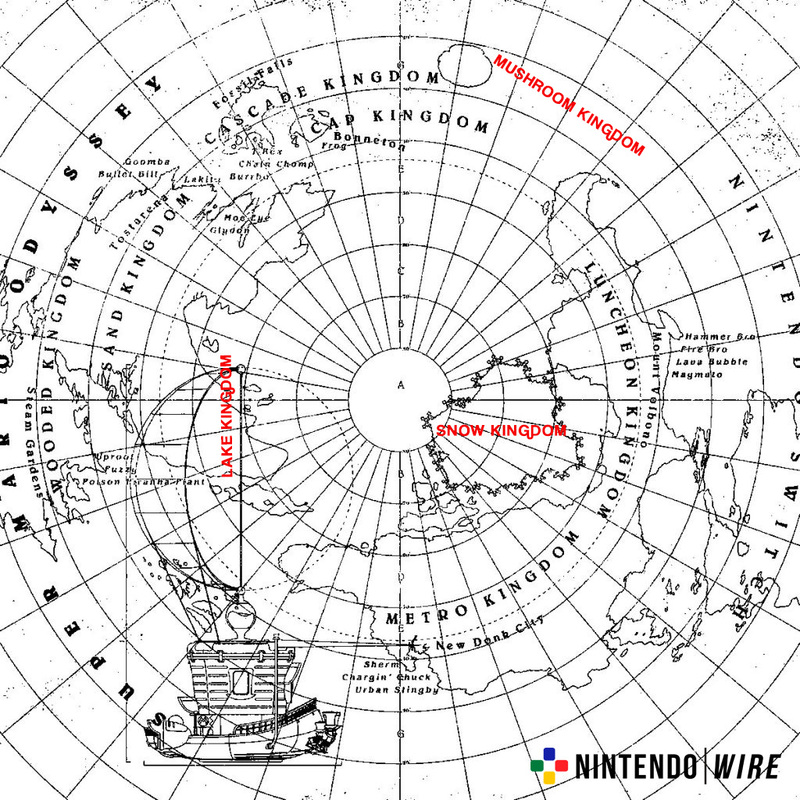 There’s been fan speculation as to where places like Sarasaland and Dinosaur Land might be located, but those were never referred to as continents that I can recall. 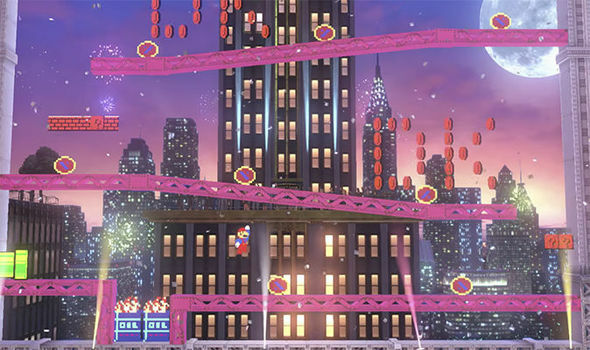 Another oddity involves New Donk City, which appears on the map to be only a small part of the larger Metro Kingdom, although I don’t think you ever get to explore the rest of it. It appears to be shaped a lot like North America. Anyway, New Donk features indications that it’s where the original Donkey Kong game took place. 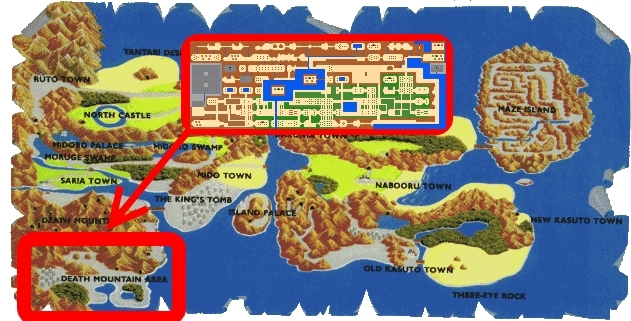 It was also said (or at least strongly implied) that Big Ape City in Donkey Kong Land was the location of the famous battle between plumber and gorilla, but that’s apparently on Donkey Kong Island. I guess it’s possible that Donkey Kong Island is part of the Metro Kingdom, but I don’t know how likely that is. Maybe Mario and DK had matches in a few different cities. Regardless, while New Donk has a lot of names from the DK series, I haven’t heard about any actual Kongs showing up, except for a cameo from the eight-bit DK in a two-dimensional segment on a tower wall. Instead, it’s full of inhabited by giants in business suits and hats. 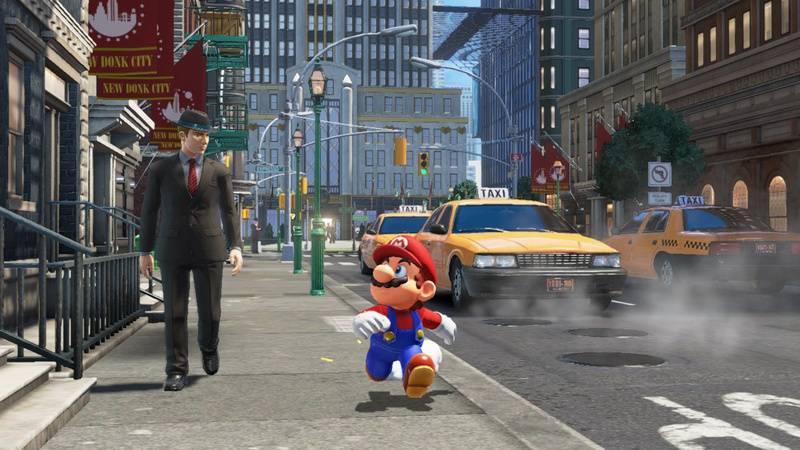 Okay, maybe they’re not supposed to be giants, but they tower over Mario. Our hero is small, but I don’t think he’s THAT small. A character guide from 1993 referred to Mario’s species as homo nintendonus, so maybe he is significantly different from homo sapiens. So what does that mean for other characters who look more human than anything else but still have cartoonish features, like Peach, Daisy, Professor E. Gadd, or Captain Syrup? Pauline, who’s the Mayor of New Donk, kind of seems to be a cross between the two sorts of person. Speculation on GameTheory has it that the New Donkers might be so large because they eat magic bananas like those in the Kongs’ hoard. Did the humans drive the apes out of the city, but retain street names in their honor, as with places in our country with Native American names? Are the Kongs local celebrities but still a minority? Or, if it is the same as Big Ape City, maybe the Kremlings conquered the apes and the humans the Kremlings. We may never know. This entry was posted in Donkey Kong, Dragon Quest, Maps, Mario, Video Games, Zelda and tagged big ape city, captain syrup, dinosaur land, donkey kong island, donkey kong land, dragon quest ii, homo nintendonus, isle delfino, metro kingdom, mushroom kingdom, mushroom world, new donk city, paper mario, paper mario: the thousand-year door, pauline, princess daisy, princess peach toadstool, professor elvin gadd, pudding continent, sarasaland, super mario odyssey, super mario sunshine, the adventure of link, toad town. Bookmark the permalink.